ScienceDaily (2007-03-20) — Most of us would know our mother’s voice on the phone from the first syllable uttered. 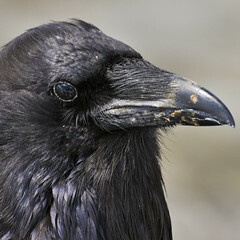 A recent Cornell study suggests that crows also can recognize the voices of their relatives. This woman did a lot of in-depth research for this study. 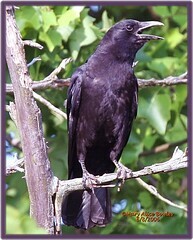 I am not surprised in the least to find out that crows recognize each others voices. We do. We are so egocentric sometimes! 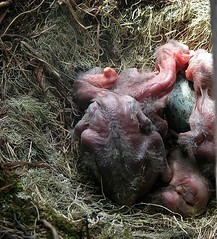 This is the second raven baby/egg photograph and post. Thanks to the photographer, poecile05, for sharing this on flickr and allowing us to blog it. If you read yesterday’s post, you know how much a baby raven can and must consume. I shared with you a small part of a book I read, “Mind of the Raven” by Bernd Heinrich. The high maintenance baby ravens don’t stop with just a need for attention and an enormous amount of food. They also require some special attention to see to their “bathroom” needs, if you will. You may recall from yesterday’s post that nestlings eat A LOT of food. For every action there is an equal and opposite reaction. Yep! That is right. Almost every amount that goes into the baby ravens must come out. Since they can’t lift themselves up to hang over the side of the nest for at least a couple of weeks, their parents must take care of this expediently. Remember, if they eat six woodfrogs and two mice IN ONE FEEDING, then you can imagine how much waste that much food produces after EACH and EVERY FEEDING! 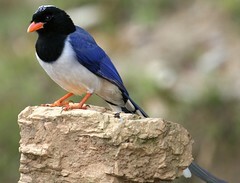 They would quite literally be drowning in a bowl (their nest) full of their own liquid dung (also known as ‘mutes’). In order to prevent this from happening, the parents scoop up the “mute” with their beaks as it is coming out and dumps it over the side of the nest. They are the equivalent of live pooper-scoopers. Not so fun, not so simple. Imagine how much time this takes and then recall how much food they need. You can see clearly how much time parenting takes in a raven’s life. Isn’t it amazing? Excellent shot. Thanks to österreich Ungern or cartmann at flickr. I have a new buddy on flickr and they have this photograph in their album. WOW! I love this. Is this not an excellent photograph? It is a very nice up-close picture with excellent detail and great composition. I thought it was worth sharing. I think I’ll be looking through flickr more often now that I have found the “blog this” button. Great job Robinsegg! I am eager to see more of your work.